A Tale of a Magical Mystery Tour and the Tent! A well placed club banner! A Magical Mystery Tour and the Tent by Carol Burnapp. Going to any event away from home turf could be considered to be a magical mystery tour. Driving off into unknown territory is the start of the tour. If all goes well, you will arrive at the parking area without any problems. The next part of the mystery tour is when you pick up your map and get a look at your course for the first time. This will present challenges of its own. And for some, the final mystery will be where the car is in a parking field that was nearly empty when they arrived but now contains a few hundred cars. A well placed club banner can help with this! Then you get events like Day 3 of the recent Lakes 5 competition. 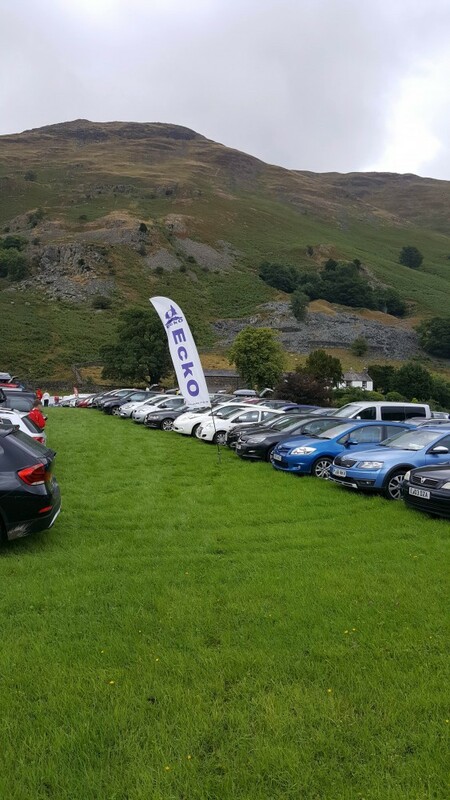 Due to insufficient parking space at the event, many competitors were requested to park at the Auction Mart in Cockermouth and take a 20 minute bus ride to the competition area at Winlatter. The day started well. Jan, Andrea and I arrived in Cockermouth in plenty of time, parked and proceeded to get on the second bus of the day. It filled up quickly and we were soon about to leave. As the bus pulled out it was flagged down by one of the organising team for the day who wanted to ensure that the driver understood where he was to go as the first bus to leave had got lost. We were on our way! At the first roundabout the bus turned right and the man in the seat behind Andrea muttered “he’s gone the wrong way”. That didn’t bode well. The driver appeared to be using his satnav for directions (and we all know how dangerous they can be!) but he kept being told to turn down roads that were too narrow or where the turning was too tight. “My bus is 7 foot 6 and that road is only 6 foot 6” he was heard to say a number of times. At one point the driver executed a 3-point turn in the middle of a single track road with the help of extra room provided by a caravan park entrance. I had no idea where we were by now and I’m not sure the driver did either. At this point a Norwegian competitor with Google maps on his phone came to the rescue and took on the role of navigator. We finally arrived at the arena 50 minutes after we set out having seen quite a bit of the surrounding countryside. As long as you ignored the 7 tonne weight limit on the bridge we crossed (“how heavy is the bus?” we asked to a reply of 16 tonnes! ), the blasting of the bus horn to get a builder to come and move his van so we could get through and the rather surprised cyclist that we passed twice, then all was good. A word from the now wise – ensure that bus drivers know exactly where they are supposed to be going or that someone on the bus does! Thanks should also be extended to the start officials that calmly allocated new start times to the two busloads of late competitors. Another story to come from this day deserves telling as the presentation of the club’s Wooden Compass trophy is not far away. This trophy is for those silly things that happen that you would rather everyone else didn’t know about. In preparation for this event, knowing that we wouldn’t have the car to go back to, Jan had bought a small popup tent to use in the arena to save us having to take the heavy club tent on the bus. This was great. It went up really quickly, our kit bags were thrown inside and we all headed off to run our courses. At the end of the day the new tent needed taking down. Jan reliably informed us that she had practised this at home and proceed to bend the tent into all manner of shapes but none that were going to fit back in the bag. Some folk from another club were watching on and finding this most amusing. They even turned their chairs around for a better view! After a few minutes of struggling no progress had been made but much laughter was being heard from our onlookers. Then a man came over to help. He had the identical tent and thought he knew what he was doing – no such luck. Finally his wife came over and ‘girl power’ reigned supreme once again as with a couple of twists the tent finally collapsed down into the required shape and was quickly stuffed into its bag before it got a chance to ‘pop-up’ again. This was greeted to resounding cheers from our audience. Now where to for my next adventure? Ah yes, Somerset for the British Sprint and British Middle Distance Championships at the beginning of September – hopefully with a trip to Wookey Hole and Cheddar Gorge too.